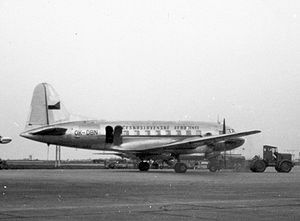 The Ilyushin Il-12 (NATO reporting name "Coach") was a Soviet twin-engined cargo aircraft, developed in the mid-1940s for Aeroflot. The aircraft was intended to replace the Lisunov Li-2, which was a licence produced version of the Douglas DC-3. The new aircraft followed a classical layout for a twin engined transport, with a metallic structure, monoplane wings, a conventional tail section. One major improvement over the Li-2 design was the tricycle gear, which allowed better visibility when taxiing and landing. It had increased wing surface compared with the DC-3/Li2, which was necessary owing to the increased power. The aircraft made its maiden flight on 15 August 1945 , powered by two ACh-31 diesel engines (each producing 1,500 hp). It was soon decided to re-engine the aircraft with Shvetsov ASh-82 radial engines, the revised aircraft flying on 9 January 1946. It was found to have major problems during testing, having poor engine out characteristics and requiring a strut under the rear fuselage to prevent tipping during loading due to CG problems. Further problems was the use of magnesium near the engines which in case of engine fire could cause a uncontrolled fire, damaging the wing structure. This led to a crash with a complete loss of lives after the wing of the airplane collapsed during flight after an engine fire. The magnesium was replaced by aluminium alloys. The fuselage had a considerable volume, and was equipped with eight rectangular windows on each side. The crew consisted of 3 and the aircraft could transport 32 soldiers, 32 parachutists or cargo. There was also a civil version, which although designed to carry up to 32 passengers, was limited in Aeroflot service to 21, with normally only 18 carried. This meant that use of the Il-12 for passenger use was un-economic. Some 663 Il-12 were manufactured. The aircraft was later improved into the Ilyushin Il-14. Il-12 : Twin-engined passenger, cargo transport aircraft. Il-12A : Unmodified Ilyushin Il-12 aircraft. Il-12B : Modified Ilyushin Il-12 aircraft, fitted with an improved de-icing system, lengthened nosewheel and a small dorsal fin fillet. Il-12D : Twin-engined military transport aircraft for the Soviet Air Force. Stroud, John. Soviet Transport Aircraft since 1945. London:Putnam, 1968. ISBN 0 370 00126 5.